So Anzula. I love it. You know it. They make the best yarns. So many delicious bases. And the colors are swoon-worthy. And the people. Anzula people are some of my favorite people in the industry. So when they want me to design with their new yarn I say yes. I say hell yes! Does your local yarnstore stock Anzula? They should. They should stock the new Croquet base (DK, 250 yards, 50/50 silk/merino) so you can knit up this beautiful thing. This thing is the Nelina Cardigan. And you are in luck, because the pattern for this thing is free. 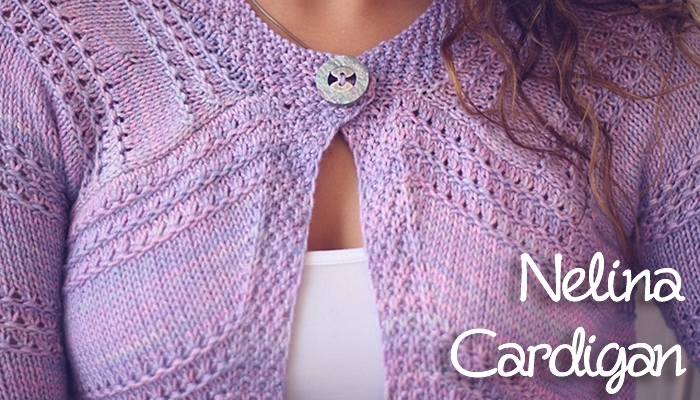 The First Fall 2015 Issue of Knitty is live and the lovely Nelina Cardigan is a part of it. So all you need is the yarn and some size 6 needles and a big ole pretty button to close it up! Nelina is kind of a raglan, but not quite. The diagonal panels fit just so into sleeves to make the most of hand-dyed yarns and to make the knitting fun and the yarn go far! So head on over to Knitty to get your pattern and get your hands on some Anzula Croquet in your favorite color!